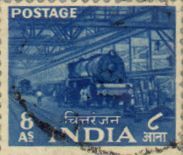 India Railway Indian Railways in Postal Stamps (1937-1977). 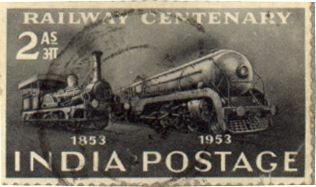 Indian Railways in Postal Stamps (1937-1977). A collection of images of stamps pertaining to railways in India, from the author's collection, along with notes and technical details. Please click on any image thumbnail here to see a bigger version of the image. Also see Vikas's article on IR-related First Day Covers, article on IR-related coins and cards, and the album of railway-related postage stamps in the picture gallery. Apart from these IRFCA resources, there are some collections of IR-related philatelic material accessible on the Internet. One example is Sandeep Chaurasia's collection. 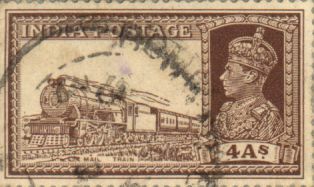 This 4-anna stamp released in 1937 depicts a portrait of King George VI and a 4-6-2 steam loco of East Indian Railways along with mail cars. On April 16, 1853 a train with 14 railway carriages, 3 locomotives Sindh, Sultan and Sahib, and 400 guests left Bombay at 15:35 hours. This was India's first rail run. The train left Bori Bunder for Thane with a 21-gun salute and the Governor's band to see it off. The journey took an hour and fifteen minutes. Vulcan Foundry, England manufactured the locomotives used on this run. A total of eight engines, GIP Nos 1-8 and bearing makers numbers 324-331, were ordered from the foundry in 1852 and the locomotives were of the type 2-4-0. These were the earliest known locomotives in service in India then. The earliest steam locomotive still in service has been certified by Guinness as the Fairy Queen. This is a 2-2-2 type locomotive manufactured by Kitson, Thompson and Hewitson, UK for the East Indian Railways (EIR). Kitson and Co supplied these locomotives (2 in number) in 1855. These were numbered 21 and 22 and later renamed EIR 91 and 92. They acquired the names Express and Fairy Queen respectively in 1895. From the beginning up to 1869, the construction and working of railways was left entirely to companies with some form of guarantee. From 1870 to 1880 all new lines ware constructed by the direct agency of the state and with state funds. From 1880 up to 1907 the operations of both the state and aided companies went on side by side. From 1907 onwards all major lines were purchased by the government and leased to private companies for operation. 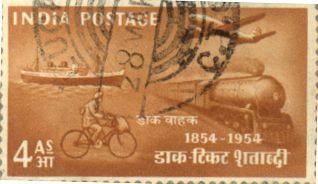 The 2-anna stamp depicts 2-2-2T 'Express' of 1853 and WP-1 of 1953. On October 1, 1954, India completed 100 Years of the issue of its First Postage Stamp, which also coincided with the placing of the Post Offices under the centralized control of a Director General. 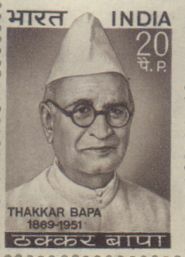 India has the unique honor of being the first country in Asia to issue postage stamps. To celebrate the historic occasion of the Centenary of India Postage Stamps on 1st October 1954, the Department issued four commemorative stamps, in denominations of 1 anna, 2 annas, 4 annas and 14 annas depicting the different modes of carrying mails during these 100 Years. The 4-anna stamp depicts a 4-6-2 class WP-1 steam loco and mail cars. 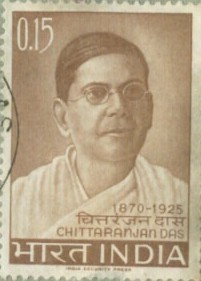 Among the personages who shaped the destiny of the Indian struggle for freedom, Chittaranjan Das ranks as one of the most outstanding and prominent patriots who sacrificed his all for the country's cause. Born on 5th November 1870, C. R. Das had his early education in the London Missionary Society Institution, Bhowanipur, and graduated in 1890 from the Presidency College, Calcutta. He then proceeded to England where he joined the middle temple and was called to the Bar in 1892. He returned to India in 1893 and enrolled himself at the Bar of the Calcutta High Court. During his early years as a lawyer intimately associated as a budding poet with Rabindranath Tagore. After a series of sensational criminal cases in which he appeared to use his vast knowledge of British Law for the defense of patriots and the advancement of the cause of India's freedom, the most famous of which was the case in which he defended Sri Aurobindo Ghose accused in the Alipore Bomb Conspiracy case, and his success in a number of civil cases, particularly the Dumroun adoption case, his reputation as a brilliant lawyer was established. He gave up his lucrative practice, which was fetching him a princely income while at the height of his profession in order to through his weight fully into the freedom struggle. Although revolutionary in his ideas, he was apposed to violence and was a staunch votary of constitutional methods. A founder of the Swaraj Party within the freedom movement, he advocated fighting the British Raj from within the council chambers. True to his own statement 'If I live, I live for Swaraj, If I die, I die for swaraj', Chittaranjan Das thought, dreamt, talked and worked for the freedom of India and nothing else till the very day of his untimely death on 16th June, 1925. A brilliant barrister, poet, journalist and philanthropist, Chittaranjan Das's claim to greatness lies more than anything else on his ardent patriotism. 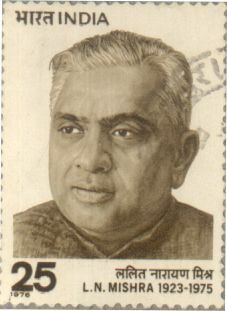 The Indian Posts and Telegraphs Department bought out a commemorative stamp on 5th November 1965, the occasion of his birth anniversary. Electric Locomotive — definitive series. An early DC electric locomotive features in stamps of a definitive series issued in large numbers and used for many years. Another specimen of this series may be viewed at the album on railway stamps in the picture gallery in addition to the image above. To the right, a specially overprinted specimen is shown. The production of electric locomotives commenced at Chittaranjan Locomotive works in 1961. The first 1500V DC WCM-5 Locomotive named 'Lokmanya' was commissioned by Pandit Jawaharlal Nehru on the 14th of October 1961. 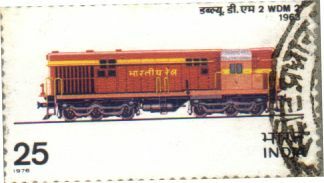 The stamp depicts a WCM-5 from Kalyan shed in its original livery. Overprinted version The International Control Commission consisting of representatives from India, Canada and Poland, was formed to supervise the agreement signed on July 21, 1954 between France and the Democratic Republic of Vietnam. The agreement provided for the temporary division of Vietnam at the seventeenth parallel until such time as elections could be held. Indian forces were stationed in Laos and Vietnam beginning in 1965 until 1968.The planned nation-wide elections never materialized. When the ICC was reconstituted as the International Commission for Control and Supervision in 1973, India opted not to participate. Thakkar Bappa was born on the 29th of November 1869 in a middle-class family of Bhanagar in Saurashtra. His father Vithal Das Thakur named the child Amrit Lal. He received his first schooling for benevolence and service to humanity from his father. He got his L.C.E (Licentiate in Civil Engineering) from Poona in 1890. He worked as an engineer creditably in Porbandar and later went out of India to serve in laying the first railway track in Uganda. He served also as chief engineer in Sangli state for some time. Here he saw the miserable conditions of scavengers who had to dispose the refuse of the whole town of Bombay. He was shocked to see the filthy colonies where the sweepers had to live and made a firm resolve to devote the rest of his life to alleviate the lot of these people. After this he resigned form service and in 1914 joined 'Servants of India' society. He was the inspiration for many missionaries in the cause of the service of the backward classes and the tribal people and for other constructive workers. The International Union of Railways, otherwise known as UIC was founded in 1922. Its objective is to standardize and improve on the railways with special regard to International traffic. The UIC is also responsible for ensuring co-ordination and unity of action amongst the International Railway Organization. Since 1950, the UIC has set-up 4 new offices, namely, (a) The office for Research and Experiments (ORE) for the pooling of means on technical research; (b) Information and Publicity Center of the European Railways (CIPCE) for publicity and public relations regarding the railway activities; (c) International Railway Documentation Bureau (B.D.C.) which facilitates exchange between the railways, (d) The Railway Films Bureau (B.F.C) which enables information to be exchanged in that field. 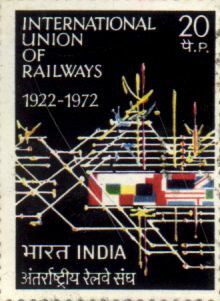 The Indian Railway has been associated with the International Union of Railways since 1957. The Union celebrated its golden jubilee in 1972. These celebrations had a special significance for India because on this occasion the UIC held a Colloquium on 'sharing of Railway Knowledge' which was presided over by the Chairman of the Indian Railway Board, and was attended by a number of representatives from railways of both developed and developing countries all over the world. Of all the members of the UIC, the Indian railways have the biggest route kilometrage. The Indian Posts and Telegraphs department bought out a commemorative stamp to mark the Golden Jubilee of the International Union of Railways. 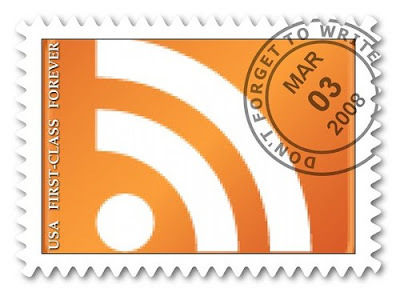 The stamp design is based on artwork by the well-known French artist George Mathieu. Lalit Narayan Mishra was born in January 1923 at Basupatti in Saharsa district, Bihar. He took to politics in his student days, organized the Bihar Provincial Student Congress in 1941, and was its secretary in 1945-48. He did his MA in Economics from Patna university in 1948-48. His rise as a leader of national stature began in 1950 when he became a member of All India Congress Committee. He was a member of the first and second Lok Sabha. He was unanimously elected as a member of the Congress working committee in 1972. He held various high posts in government. He was Parliamentary secretary, ministry of Planning, labor and Employment (1957-60), Dy.Minister for Home affairs (1964-66), Dy.Finance Minister (1966-67), Minister of state for defence production (1967-70). From 1970 till Feb 4,1973 he was minister of foreign trade. On 5 Febrauary, 1973 he was appointed minister if railways with cabinet rank. As minister of railways, he visited Samastipur on 2 January, 1975 to declare open Samastipur-Muzaffarpur broad gauge railway line. A bomb explosion on the dais seriously injured him. He was rushed to the railway hospital at Danapur where he succumbed to his injuries on 3 January 1975. GIP No 1: This engine is representative of the earliest engines employed in India. To operate the train service between Bombay and Thane, the Great Indian Peninsular Railway ordered eight locomotives from Vulcan Foundry, England. These engines GIP Nos 1-8 were manufactured in 1852, bearing maker's numbers 324-331 and were, excepting two contractors locomotives of 1851, the earliest type in service on the railways of India. The first engine entered service in 1853. F/l - This was the most widely used engine on Indian Railways before Independence. It was extensively used on Rajputana Malwa Railway, which became the meter gauge section of the Bombay and Central Indian Railway. The first of these engines was built by Dubs & Company Glasgow in 1875. From 1895 these engines were also manufactured in India at the Ajmer Railway Workshop. These were withdrawn from active service in 1958. The engine depicted on the stamp was manufactured at Ajmer in 1895. WP/I: The standard post-war broad-gauge express locomotive is the WP class 4-6-2 'Pacific' type. This design was the outcome of detailed study of previous types and incorporated the result of research into efficiency and mechanical details. Sixteen prototype engines were built in the United States in 1947 and after exhaustive trials and minor alterations, 300 further engines were ordered from a number of suppliers. In 1963, manufacture of this type was started at Chittaranjan Locomotive Works. WDM2 Diesel: This is the most widely used diesel locomotive in India This locomotive is a mixed class design with 2,600 hp. weighing 113 tons and hauls freight trains of 2,250 tons and mail trains with 18 coaches. These engines haul nearly 56 per cent of the total freight traffic on the Indian Railways and important mail and express trains The Diesel Locomotive Works at Varanasi has a capacity to manufacture 120 such locomotives per year. Railway Letter and Parcel Stamps. Unusual Stamps from Around the World (Part 2). Unusual Stamps from Around the World (Part 1). India, stamp issues in 2012 (September-December). India, stamp issues in 2012 (May-August). India, stamp issues in 2012 (January-April).